It’s been back to back reads with strange meta-narrative, mobius plot threads (I followed this one with Bats of the Republic) The Impossible Fairy Tale is weirdly unsettling and moves ahead with a grim inevitability following the intertwined lives of two 12 year old girls. The language skitters off on strange tangents and plays with words in a way that must have proven a unique challenge to translate. Violence and death constantly linger in the periphery but the tangents pulled me out of the story making me wish for the relentless energy of Samanta Schweblin’s David in Fever Dream, who kept the narrative on its creepy track. The novel then shifts it’s focus halfway through and the book becomes something else entirely. I just couldn’t get invested enough to truly follow along and make the necessary connections. And I was frankly still catching my breath from the ending of the first half. Inventive and challenging, it just wasn’t what I was after. A very strange but interesting book. I liked it but I'm not fully sure how I feel about it. Very odd but worth the read (I think). Really weird, strange book. I have no idea what to think about it yet, but I think I liked it? Asian authors have been killing it with unique narrative voices lately, and this is no exception. This book is published by a small UK publisher Tilted Axis who publish “books that might not otherwise make it into English, for the very reasons that make them exciting to us – artistic originality, radical vision, the sense that here is something new.” Their name refers to their aim to tilt “the axis of world literature from the centre to the margins ...… where multiple traditions spark new forms and translation plays a crucial role.”It was founded by Deborah Smith, the English-Korean translator of Han Kang’s “The Vegetarian” and winner with her of the 2016 Man Booker International Prize.Smith has commented on the founding of Tilted Axis “The idea initially came out of my own work as a translator, getting an insider’s view of the publishing industry and discovering some of the implicit biases preventing certain books from making it through into English. So our main objective is to subvert or circumvent as many of those biases as possible by publishing under-represented writing, which is an intersection of original language, style, content, and often its author’s gender. To publish it properly, in a way that makes it clear that this is art, not anthropology. To spotlight the importance of translation in making cultures less dully homogenous. To push for better rates and recognition for translators themselves”.The original author of this book is the Korean Han Yujoo, herself both a translator (in her case of English literature into Korean) and a publisher (her own micro-press Oulipo Press focuses on experimental literature).The translator of this book is Janet Hong a writer and translator living in Canada. In fascinating end note to her translation she comments that just as she was embarking on the translation she read a very favorable review of the original book by a Korean literary critic who then “noted that the story relied heavily on wordplay …and that such sections would unfortunately be lost in translation”.It is clear both from the translation that a kind of stream of consciousness wordplay, relying on word association and transitions between similar words is key to the novel – and the complexity of this is I think increased by the key role played in this by Korean characters and by what I understand to be the greater prevalence of onomatopoeia in the Korean language compared to English.My first reaction when I hear of the attempted translation such a book is two-fold – firstly to ask whether the book itself is really in any sense the same book as was originally written; secondly to query if the effort in translation can really be justified.To her credit the translator addresses effectively both these issues in her end note. The first by saying that she worked with the author on the translation (something I think which must be made a lot more valid by the author’s own translation ability and presumably English fluency). Secondly by stating (in what I think is an admiral sentiment) that the translation is a result of “a humble, passionate and joyous attempt [to share] this chilling, exquisite, mesmerizing tale with readers who otherwise would not have had access to the original”.The book has two distinct parts. The first tells the story of two children – the first is two contrasting twelve year old classmates. The first is Mia, a child with (for reasons not entirely clear) two fathers, from both of whom her mother seems estranged, a situation she exploits to her own advantage, by leveraging the guilt of the three parents to get what she wants. Mia herself could be described as pre/early-adolescent, feeling to herself misunderstood and unfortunate, but to others as being blessed with looks, intelligence and possessions. She talks about violent acts (being for example taken with a detective novel where someone is killed by the sharp end of fountain pen dropped from a great height) and thinks about killing others, but its clear her talk and thoughts are very theoretical and childish.The second is quite literally anonymous, both to us and to her classmates – known only as “The Child”. She is clearly physically and mentally abused by her parents – and yet, as part of her anonymity and invisibility, the other children and more damningly the adults at the school, completely overlook and even rationalise the clear evidence and signs of that abuse (bleeding, bruises, even ripped off fingernails). The Child also thinks violent thoughts – but it is clear in her case firstly that her experience and knowledge of violence is much more real and mature, and secondly that the boundary between thought and action is much more blurred (for example when she murders a stray cat).The children’s society is one marked by the almost casual acceptance of violence – the children by small chicks and then devise ways to kill them, their default game when adults are not present is the “fainting game” where they choke each other to the point of passing out. As a fairytale this owes much more to the traditional fairytales, with their assumption of darkness and malevolence, than the Disney-fied versions of childhood innocence – and there is an unsettling undercurrent to the story which we know is going to end far from happily ever after.Chapters alternate between the viewpoints of The Child and Mia, and the Child’s sections in particular grow in menace, undercut by the increasing use of rhythmic and often violent word imagery and associations. A repeated theme in this section is a series of forking paths outside of the school.The second part of the book takes a distinct meta-fictional turn – it starts with a series of odd dream sequences, but then the narrator of the second part, seemingly a teacher is confronted in a class by an unexpected and familiar face. We realise that the narrator is the author of the first part of the book, and the other character her fictional creation The Child, and that time is somehow mixed between the events of the book, and the period in which the author meets her own creation (possibly 8 or 15 years later). The Child retraces some of her actions in the first part, reads the journals the author wrote when she was reading the book and debates with the author who was really responsible for The Child’s actions in the first part – The Child or the author who had planned out what she was going to do.As an example in the journal, The Child reads (in what serves as an excellent description of the contrasting characters of Mia and her in the first part)“Scary, fearful, sickening, terrifying, hideous, frightful, chilly”. These were probably meant for me. And below were these adjectives “premature, immature, unripe, young, delicate, childish”. These were probably meant not for me, but someone else. I’m sure of itThere are further hints that in writing the first part, the author based the character of The Child (and possibly Mia) on aspects of her own childhood. Before she meets The Child, she saysI can disguise my childhood and as I disguise it I can make allusions, and as I reveal details about the allusions, I can make them appear fictitious, and in this way I can deceive you all.When The Child confronts her after class, the meeting is precipitated by the narrator falling down stairs (in the same was as happens to The Child frequently in the first part); further her initial reaction to seeing The Child face to face is:The face is unfamiliar. The face watches me in silence. I see myself in that face. It’s actually mine. We may have had the same childhood. She’s me. You’re me. But I’m not me and I don’t look like anyone else. I sense that the writing about me has already begunThis impression is made stronger by a powerful section in the first part, which completely goes against the flow of the rest of that part, and features short paragraphs on each of the class members, featuring some incident from their childhood which they remember (seemingly as adults).The second section, like the first, features the same stream of consciousness, word-association, wordplay. Unfortunately this technique is not always (in fact not often) successful and instead distracts from what from the core elements of each part – the growing menace of the first part and the meta-fictional aspects of the second.As an example a bizarre dream sequence early in the second part, contains repeated variation around a nag which is nagging the narrator, a dog which has dried out, discussions of the word confusion having no opposite, some very odd discussions of the differences between lilacs and buttercups and lots of repetition of the word bricks. Some of this effect may be lost in translation – for example I have no idea of what lies behind the choice of the nag that nags and what was in the original Korean, but whatever it was the effect in English is very weak. However I suspect that most of the fault is not barriers in the translation, but ones that the author has added herself in the original Korean. Disappointingly and surprisingly for someone who I understand started her writing career in short stories, Han Yunjo seems unable to write the tight prose that is really needed to add real menace to the first part and real insight into the authorial process into the second. My thanks to Tilted Axis for a review copy. The Impossible Fairy Tale is published by Tilted Axis Press.Founded in 2015 and based in south London, Tilted Axis is a not-for-profit press on a mission to shake up contemporary international literature. Tilted Axis publishes the books that might not otherwise make it into English, for the very reasons that make them exciting to us – artistic originality, radical vision, the sense that here is something new.The novel was written by Korean author Han Yujoo and translated by Janet Hong. Whilst I have zero knowledge of Korean, I believe from what I read in the English version that translation must have presented some serious challenges. If I have read the book correctly, there is a lot of word play, word association, word trickery involved and this must be every translator's nightmare (just because a word spelled the same can have several different meanings in one language - my favourite in English is "scuttle" - that does not mean the same word will have the same different meanings in another language. In fact, I doubt that ever really happens).Fellow Goodreader Paul has far more inside knowledge about Korean language and culture than I do and his review is well worth reading for both those insights and for his comments on the book in general. (https://www.goodreads.com/review/show...).My gut feeling is that we mere mortals lacking in Korean language skills perhaps miss some of the important aspects of this book.The book is split into two parts. The first part tells us the story of Mia and The Child (no name given), along with several other characters, although adults are mostly noticeable by their absence - they are referred to rather than active most of the time. You know a book is going to get a bit creepy when a child is given a title rather than a name. Mia has a relatively good life. In fact the book says Mia is lucky. She does not lack for things. On the other hand, The Child has a hard life. Somewhere outside of the book, her domestic situation seems to include a lot of abusive physical and mental violence. To begin with, The Child seems perhaps a rebellious, naughty child. But her actions gradual turn darker and darker until a final climax at the end of the first part of the book. This won’t be a surprise to most readers as there are plenty of hints and the general mood of the story indicates that what happens is going to happen.The second part of the book is where things start to get really interesting. This second part takes the form of a first person narrative which the author writes to/about The Child. This becomes then an exploration of what it means to create a character in a novel (and what it means to BE a character in a novel). There are multiple references back to the story in the first part. For example, in the first part we read of The ChildShe habitually eats paper. Without being aware of it, she tears the paper into little pieces and puts them in her mouth.And then we read the author writing to The Child in the second half sayingYou habitually eat paper. Without being aware of it, you tore the paper into little pieces and put them in your mouth.There are other examples along the same lines.And we see the author thinking about what it means to create a character when she writesEvery time I see you enact the habits I’ve designed, I feel both an unnameable sense of happiness and unease.And we see the created character starting to take on a life of its own when The Child, in the dialogue written by the author, saysI’m going to write what you’re unable to write,…In this way, there are elements of this book that remind me of An English Guide to Birdwatching, because both books exist in two halves where the first half tells a story and the second half the reflects back that story in some kind of meta-narrative fashion. The approach these two books take to this is very different, with Birdwatching taking a more theoretical stance and this book exploring a dialogue between the author and one of her characters. But there are definite similarities in the overall ambition of the books. You can tell by my ratings which one I preferred, although I am not sure I have got the balance right and may change my mind. What Birdwatching has in theory and intelligence, this book makes up for with atmosphere and drama, so it’s a difficult one to decide. Of course, there isn’t normally any real requirement to decide between books. They have similarities and they have differences, so perhaps best to leave it at that. The Impossible Fairytale, by Han Yujoo (translated by Janet Hong), tells the story of The Child, a twelve year old girl living in Korea who, unbeknown to anyone at her school, suffers appalling abuse at the hands of her mother. She deals with her pain by inflicting suffering on others. She wants to kill.The Child has learned that punishments are minimised if she is can get through each day unnoticed. She moves softly, interacts only when necessary, rarely speaks. She lives life on the margins, merging with the background of others’ everyday existence.The reader is introduced to her classmates. Mia is a pretty girl granted everything she desires by her indulgent parents. She keeps two journals – one to be handed in at school and one for her secrets. As she lives a gentle, unconstrained life her secrets are few.The boys in the class play rough games, hurting each other in the name of fun. They torture and kill insects and small animals. They mercilessly bully a child with special needs. Mia and The Child observe this behaviour. The casual cruelties of children are horrifically portrayed.The Child acquires a key to the classroom and writes in her classmates’ journals. When her tampering is discovered the teacher demands that the culprit come forward, to no avail. The Child is worried that she will be discovered and attempts to hide what she has done. A chance encounter draws Mia into her web with devastating consequences.The second part of the book picks up the story and turns meta, developing it from the point of view of an author completing the work. This change took some time to segue with before regaining my attention.Throughout there is much play on words. The voice employed in both sections is detached yet compelling. There is repetition and a number of strange dream sequences but what is conveyed remains chillingly coherent.The writing is savage, playful, visceral and intellectually stimulating. There is a raw energy to its progression, a dreadful realism at the heart of its depictions that make them grim yet gripping.Unusual but never difficult, this is an impressive read.My copy of this book was provided gratis by the publisher, Tilted Axis. This book has all the ingredients of something I should love. Strange Asian magical realism about dark, disturbing children? Twisted fairy-tale elements? Surreal and unsettling writing? A surprise meta-narrative? Yes to all of these things. And while I think The Impossible Fairy Tale does a lot right, I found it falling surprisingly flat for me by the end. My absolute favorite element here was the writing itself. It's strange and disturbing and unlike anything I've read before. The narrative will circle around itself, starting with an idea or concept and discussing it in a strangely repetitive fashion before veering in a totally different direction. There are large chunks that literally feel like you are in a dark fairy tale: it's confusing and gets under your skin, but also feels strangely glimmering and magical. I was totally enchanted by it, and I'll read anything Yujoo writes in the future for sure.And the first half of the story is actually fairly strong. It's definitely got that fairy tale style where the reader is kept at arm's length from the characters so there is an emotional distance, but the mirroring of Mia (the Good Child) and The Child (the "Bad" Child) was deftly done and very interesting. In fact, there are a lot of aspects of the story (from characters to plots to colors) that are mirrored so cleverly. It makes you feel off-balance because it's repetitive but also... not quite the same. Like fun house mirror versions of things you read about. My issue is the same as almost everyone else's: the big shift right in the middle. I actually loved the idea (someone writing a story suddenly confronted with a character they thought they had made up) but it went nowhere. The plot was moving along steadily, there's a big event, the characters come to life (or were possibly alive all along?) and then bam, dead in the water. It meanders around for another 40% of what feels like filler. I think there was SO much potential when The Child confronts The Author, but we got nothing out of it. It was a waste of paper, really, and I found myself insanely frustrated with this section. What was the point? I have no idea. 3 stars is usually a pretty "it was okay, I'm neutral on it" rating, but this book I both loved and hated. It was magical but frustrating, and didn't live up to either the hype or the amazing premise. I'm happy I read it because the writing is truly fantastic, but I'm also really sad about the (lack of) direction it went in to. 2.5 stars.I had such high hopes for this one and I am very sorry to report that it left me so very conflicted. There is no denying that Han Yujoo has serious writing chops, or that she has a very interesting premise going into this novel. However, I felt held at arm's length for the majority of the novel and then the second half... well, who the hell knows what was going on there.Read my full reviewhere! The plot of this book never once flowed in an expected direction, yet all the emotions behind the characters, Mia, The Child, and even Inju, felt real and fully developed. The intricate wordplay in this story showcases the highly skilled translation of Janet Hong. The way that Han Yujoo explores with her words, creating seemingly simple sentences and minutely changing a syllable or a tense to create a new meaning, a new dimension to the text was reflected so beautifully in Janet Hong's translation that it has me itching to see the original text so as to fully understand the mammoth task that she undertook.As this novel was more abstract and conceptual than I initially expected, it turned out to be much more work as a reader than I wanted. However, it was nonetheless a fascinating book and leaves me excited to read more from both the author and the translator. weird and intriguing.I reviewed this for the magazine Words Without Borders. "For a book full of so much mystery, the creative mission of Han Yujoo’s The Impossible Fairy Tale is remarkable for its author's openness about choices regarding how to tell stories, how an author reveals information, and the dissecting and peeling away of the layers of artifice inherent in the reading and writing of fiction.Broken into two parts, Part I begins with Mia, an average twelve-year-old in an average neighborhood attending an average school in South Korea in the 1990s...."
I, like many others, don't quite know what to make of this novel. I think this is my first foray into experimental fiction? But what I do know is that Han Yujoo/Janet Hong's words certainly flow off the page. I'm hesitant to really rate or review, as this is a translated work that is heavily dependent on Korean wordplay, but the fact that the English is still quite beautiful is a testament to Janet Hong's translating prowess. I can only imagine how much effort she put into capturing the spirit of Han Yujoo's words.This book is frequently described as having two separate parts, the first being about two children, and the second being about the narrator of the first story confronting one of the children (i.e. their character). Really though it's just all one meta-narrative wrapped with a ribbon of creeping horror.I think it's worth the read. Inventive and creepy. It sucked me in. Though, I guess it didn't blow me away. I've never read a book like this before. I think that I loved this book so much because I was drawn to Yujoo's style of repeating words and ideas, circling back each time to add one small detail on top. I'm so amazed that this was able to be done consistently in a translation! This book read like experimental poetry, and for that I loved it. A strange, chilling book with an unusual and unexpected meta-narrative (it half reminded me of Mr. Fox in this respect). The edition I read emphasised the role of the translator (the original Korean relies heavily on word play), which I found interesting. Overall - grim but intriguing. The prose is too exquisitely written and translated to receive less than three stars. The story is too repetitive, formless, inert to receive more than two stars. Which will it be? Two stars or three stars. The reviewer flips a coin, specifically a 100 won coin, to determine the rating. Heads is 3 stars, tails is 2 stars. Look at the coin. It is tails. 2 stars. This book is unlucky. incredible as a work of experimental fiction. incredible as a story. pushes the boundary between reading and reader, writing and writer, imagination and plot. also a total mindfuck, but in the best way possible. excellent translating. I could not finish this book. I was hugely confused most of the time. I disliked the violence involving animals and children. I stayed with it until Part 2 hoping somehow I would finally understand the point and it was just more of the same. Too many good books out there to waste time on this one. 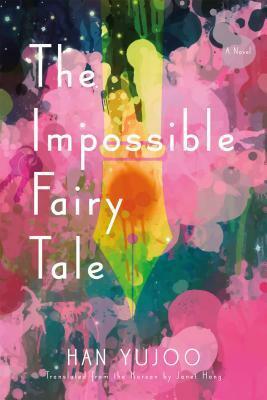 The Impossible Fairy Tale (2013) is the first novel by Korean writer Han Yujoo to be translated into English. It is short, just over 200 pages, is written in monosyllables like a children’s story, and is a very weird parable about the evil inherent in mankind, in this case in children. It’s a modern rendition of William Golding’s Lord of the Flies. The tale is told in two parts. In the first part we follow the characters in the third person, a choice that emphasizes our distance from them just as it highlights their distance from each other. The story is told in the childlike cadence of a fairy tale, a style that contrasts nicely with the underlying evil, creating a sense of evil's banality. We meet two young girls, Mia and the never-named The Child, thirteen and twelve respectively, who are in the same fifth grade class. The imagery concisely captures the essence of the two main characters: in moments of stress Mia develops “white psoriasis” around her mouth, suggesting death or purity; The Child sees “collapses” of things around her, a description of her mental state.Mia is a “lucky” girl; her mother loves her, she has two fathers whom she can play against each other for gifts that her mother denies her, she is trusting and trustworthy. Mia is also selfish and grasping, as are most fifth graders. Like all children in her class Mia keeps a school journal recording her thoughts and activities, a journal that is reviewed regularly by her teacher. She also keeps a private second journal filled largely with her material wishes. The Child is Mia’s classmate and alter ego, a “luckless” girl with an angry mother at home. The Child is pure id. She expects punishment, she feels invisible, and she shows a wide streak of cruelty fueled by the fear that her mother instills. She has visions of mice and ants tormenting her, and she wants to disappear. The Child also keeps a school journal. It is filled with beautiful words but its entries have dark and hidden meaning—it is written in a word substitution code using beautiful words in place of brutal words. For example, the word “wind” is a substitute for “bruise,” giving an entirely different meaning to a simple sentence like, “I went home and felt the wind when I opened the door.” The teacher is, of course, clueless and when she read the journal she always responds, “This has no concrete story.” It’s a summary of The Child’s life.Strange things happen in Mia’s class: chicks brought to the classroom have been dying; the children’s journals kept under the teacher’s desk suddenly have mysterious and disturbing notations like “I hate you;” the boys play the “fainting game” in which a boy is strangled until he faints; a rumor circulates among the parents that a boy in the class engages in animal cruelty with the class chicks, burning them in the microwave oven and doing other unspeakable things. The parent grapevine also says that Mia started the story and Mia’s mother is shamed by the news that Mia would start such a rumor. She confronts Mia, who says, truthfully, that she never said such a thing. But Mia isn’t believed. A search of Mia’s room brings her secret second journal to light.Disturbing events multiply and build on each other, heightening the tension—something awful is going to happen within this small collection of children on the edge of their teens. But when the awful arrives it is so sudden and stealthy that its almost unnoticed, its just another part of an impossible fairy tale. Thus ends Part 1, the central story. One would expect tht Part 2 would be the aftermath—identification of the killer, conviction, and punishment. But not so. The reader is gloriously surprised with a first person dialogue that challenges the reality of the story and the faint line between reality and imagination. This is perhaps the most unique ending of a novel that I’ve ever read. Every fairy tale has a moral. This one is that sometimes the bad things that happen can't happen. I found it exciting, but from the rather dismal average rating given it by Goodreads readers, I’m in the minority. So be it.Five Stars. This book was divided into two parts. After finishing the first part of the book, I would have given the story about 3 or 4 stars. But after the second part, my positive feelings about the book were greatly reduced. Part two of the book is experimental in nature. I like connecting to characters in a story. But in Han's experimental section, the emphasis is on showing how her story was built. As a result, I couldn't connect to the characters very well in the second part of the book. The things that I thought were positive about the book are:- The author portrayed different kinds of difficulties that children face within families. She portrayed a child who is severely abused and also a child who comes from a blended family.- The author has a talent for creating suspense. I wanted to keep reading the book and was able to finish it quite quickly.The things I thought were negative about the book (I'm going to hide this part because of spoilers):(view spoiler)[- While the first portion of the book uses conventional storytelling, the second section of the book employs meta fiction. The second section follows the author of the book as a main character. The author is visited by her character the Child. Because of this shift in the storytelling it made me not care about the story any more. Ms. Han is making the reader examine and accept that the entire first portion of the novel is made up. While reading the second part, I felt myself care less and less about the Child (though I had cared for her deeply in Part I). I tried to transfer my empathy from the Child to the author, but really it wasn't happening. I know that if the entire novel had just been told traditionally, minus the meta-fiction portion, I would have enjoyed the book so much more. - The afterword, in my interpretation, completely lacks any heart. It uses an extended math metaphor. It reinforced in me the feeling that my empathetic connection to the characters had been cut off by the author's writing style.- The author has a recurring motif about objects appearing and then disappearing. It was repeated a lot through out the second portion. I don't really understand the purpose of the motif, and also these sections made me feel nothing. I think Han was interested in the power of the author to both create and destroy the story. But I personally don't have any interest in this. Here is an example of this motif: "The four seasons pass. But no one passes by. It rains. It snows. The wind blows and clouds pass by. A heavy rain falls and a light breeze blows. It grows misty and the sun shines. You feel neither warmth nor cold. All the world's seasons penetrate you." - Lastly, I find it perhaps gratuitous to portray children committing extreme acts of violence. Or if it's not gratuitous, I can say that it's just not within my tastes. I know many readers love books like Battle Royale, which is a dystopian story full of child violence. Just me personally, it's not something I like to read. (hide spoiler)]Overall, I think this author has a natural knack for storytelling. I would definitely try out another novel from her. But I hope that if she continues with experimental writing that she works to make those portions more accessible and enjoyable for the average reader. Underneath the brightly colored cover of this book is a satisfyingly dark novel. It was a little too meta for my brain, so I had to read other published reviews to wrap my head around this. I also listened to this interview with the author herself, found at this link.The first part of the novel is a morbid story of young elementary school children, mainly focusing on a girl named Mia and another girl simply referred to as "the Child". We then go to metafiction territory in the second part.I like Han Yujoo's creative style in this novel. It's different and refreshing, though it might test the patience of some readers. Some paragraphs are deliberately repetitive and there's also lots of wordplay going on. Ineluctably, some nuances will definitely be lost in translation, so credits to translator Janet Hong for keeping the English version as faithful as possible to the original in Korean.One example of wordplay is the recurring references to dogs in the novel. In the interview I referenced above, Han briefly explains this: "Dog" in Korean is 개 (gae / geh) while "the Child" is 그 아이 (geu ah-ee). Say "그 아이" fast, over and over, and the resulting contraction becomes "개". Interesting.For now, this is all I can make of The Impossible Fairy Tale. To appreciate this more, I'll be reading this again when my "pending-to-read" list becomes more manageable.LitHub has an excerpt here. Je tiens tout d’abord à remercier les « Éditions Decrescenzo » pour m’avoir fait découvrir ce livre. J’ai choisi ce livre pour deux raisons : sa magnifique couverture avec ses couleurs pastel et son résumé qui m’a intriguée. J’ai eu un peu de mal avec cette lecture, car je n’ai pas réussi à retrouver ce que le résumé nous promettait. Il faut dire que j’ai trouvé l’écriture de l’auteur vraiment très spéciale et je dois bien avouer que j’ai été gênée par les trop nombreuses répétitions qui jalonnent le récit. Par moment, je me suis un peu ennuyée. J'ai trouvé ce roman vraiment très étrange et je pense qu’il n’était pas fait pour moi. Certains passages de l’histoire étaient même difficile à comprendre, même après parfois plusieurs lectures. Je ne sais pas si c’est volontaire de la part de l’auteur d’avoir voulu nous laisser dans le flou, mais là, pour le coup, j’ai trouvé ça un peu laborieux à lire. Je ne dirais pas je n’ai pas aimé, mais je ne dirais pas non plus que j’ai apprécié. C’est assez rare qu’une lecture me laisse ce genre de sentiments, mais je ne vais pas faire de la langue de bois et vous dire que ce roman a été une déception pour moi. Attention, je ne dis pas qu’il le sera pour vous, donc n’hésitez pas à lui laisser sa chance et peut-être que l’histoire vous plaira. À lire ! This book is incredible!The first half is like a if a book were a painting, made up of thousands of tiny brushstrokes until a full scene emerges. Tiny brushstrokes that overlap and cover each other or blend together.I read the subject of this novel as an expression of an author's attempts to be erased and eternalised in the same movement, or in the same story. She's trying to make characters that are as real as she is, and she does this by breaking them down into tiny pieces, and then those pieces down into tinier ones. The action of constantly breaking down proves the existence of the thing, because a fake thing or a lie would eventually vaporise under the pressure.The conflict then, I suppose, is that the main character does not want to exist and that the breaking hurts her.The bricks were my favourite part. When the objects of the story won't flow with it, they become bricks. There are whole paragraphs with every second word being 'brick', making the entire page into a brick wall.IT'S VERY VERY GOOD AND I LIKED IT A LOT. While 'The Impossible Fairy Tale' is interesting, unique, and very readable, it's ultimately unsatisfying. It's more of a 2.5 star read for me, but I'll give it 3. The first part of the book revolves around young children, the two main characters being Mia and a girl only referred to as the Child (she's so unremarkable she doesn't deserve a name). Mia seems to have all the luck while the Child is neither lucky nor unlucky. When the Child adds strange sentences to the journals of her classmates, an unfortunate series of events is set into place, escalating in great violence. The second part of the book revolves around the author of the first part. Yeah, strange, right? It gets even stranger. I like odd/unique but didn't feel the book totally came together in the end. The author seems to be commenting on an authors relationship to her characters, but, eh, it got less and less interesting by the final pages.